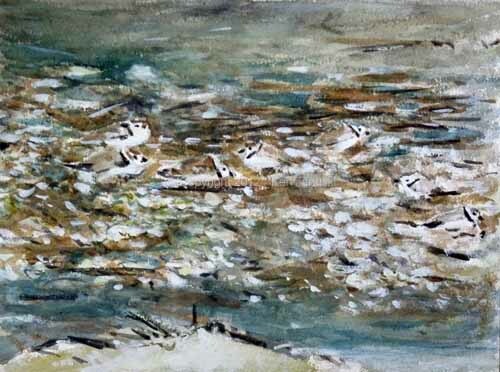 A few posts back I showed a small experimental watercolor of a number of shorebirds, almost all of them Dunlin, landing. It was an idea for an entry in the Bike Art show at Manayunk Roxborough Art Center. My thought was that the sense of dynamism was similar to that of a bike race, especially going up the Manayunk Wall and also at the sprint to the finish line. 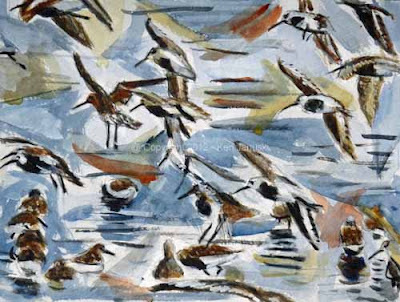 Limbs and wheels are flying everywhere just like the Dunlin wings, bills, legs. Though I liked the watercolor I wanted to try another one that was a bit larger and more developed. It is at top of post. It's about 9x12 on 140# Arches cold press paper in watercolor and white gouache. Some viewers will I think appreciate this, some will think it's a valid idea that just didn't get executed well, and some will wonder why I waste my talents with naturalistic art doing something like this. It's mainly for the last group that I'm writing this. Above is an abstract oil painting that I sold to the Philadelphia Stock Exchange, now part of NASDAQ, a little less than 10 years ago. It's representative of most of the artwork I've done in my life, before I turned from abstraction to naturalism. I don't want to write a treatise on it but will just mention Matisse's quote about a painting being an orchestration of elements with everything in the right place. I always liken my abstract art to music. It is an orchestration of color, shape, texture, composition space that all adds up to something expressive, just like music. When I turned to naturalism it was difficult to leave all that power of expression behind. Of course I gained something instead, the ability to portray nature, and thus gain all the expressiveness of nature. I'm happy I went in that direction. But sometimes I feel like there's something missing, that I'm speaking in Latin while the world converses in the Pidgin English of the web. So this bike art show gave me the chance to explore once again the melding of naturalism and abstraction. We'll just have to see what happens from here. 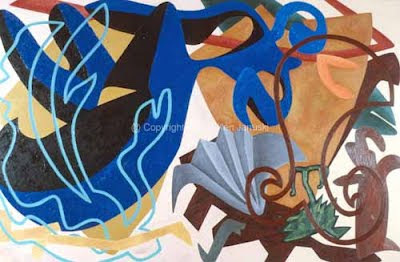 By the way the title of the abstract painting is "Short Arthur's Oblique and Non-stop Song", in honor of the jazz musician Arthur Blythe. I told you that I likened my art to music! It seems like I don't get that much developed work done during the months of April and May. I'm not sure about June. Because so many new birds are arriving, both migrants and ones that will breed here, there's always a desire to be out in the field, sketching what I see. Above is one of the more interesting sights from the Wissahickon - a male Hairy Woodpecker digging up grubs and giving one to a juvenile. Even though most migrants have passed through there's still a lot of interesting bird behavior to see, much of it family related. On the same walk where I saw the Hairy Woodpeckers I also stirred up the Carolina Wren above, who wouldn't stop scolding me. I was near an American Robin's nest at th e time but I'm sure he wasn't acting as a cross-species sentinel. Most likely he had one too. There is a competitive edge to much birding as well as an overeagerness to get a bird quickly identified. I don't really like this. It makes it into too much of a sort of shallow game. Check off the bird and be gone, off to check off another one. 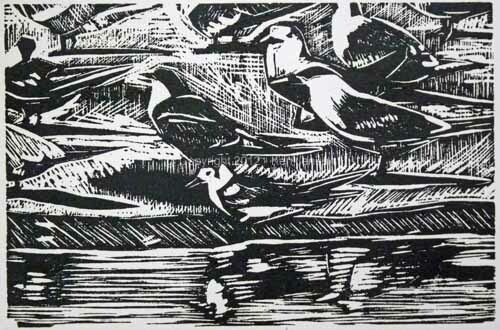 But many birders also come to love what I've portrayed here, the actual life of birds. The bottom bird in the sketch is a Louisiana Waterthrush. I suspect that he is one of a nesting pair and hope to get more sketches of him and perhaps his family as the months go by. I never posted all of my Cape May sketches so here are a few more. Above a Whimbrel at bottom, one of the many, many that we saw. Above him an osprey. You'd never guess it but I spent at least 15 minutes on it. He was bringing food back to a nest. But he never stayed long enough for me to to anything other than get a bit more of the face. Since they sometimes will sit stock still this was an unusual and somewhat disappointing situation. I kept hoping I'd end up with a full portrait. It never happened. One of the more exciting birds, at least for us that we saw in and around Cape May, was a Yellow-breasted Chat. They are often easy to hear but hard to find. This one cooperated by sitting right out in the open on a telephone wire, though only for a brief period. He was really hunched down, perhaps due to the wind, and looked far pudgier than usual. 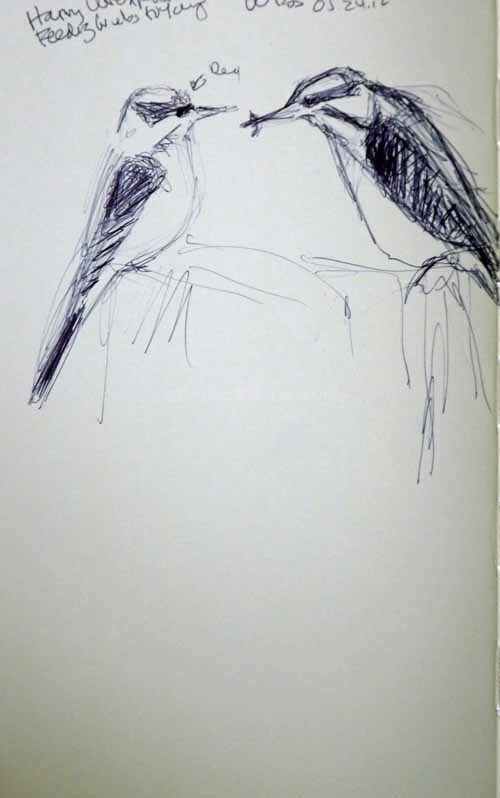 Above him a Worm-eating Warbler drawn from memory a few minutes after seeing him. And finally one of the irresistible American Oysteratchers. They are so fascinatingly odd that I can never resist sketching them if I have the opportuniy. And finally a Black-crowned Night Heron and Eastern Kingbird also from Cape May. The next time we stop at Morris Arboretum in Philadelphia I'm sure we'll see some more kingbirds. But it's always nice to see and sketch the first of the year. 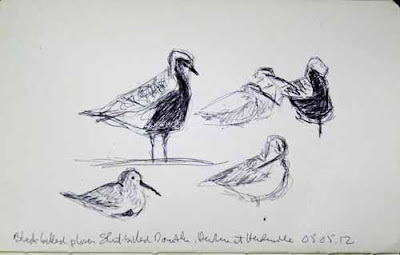 For me there's rarely anything as exciting as field sketches. They have a raw connection to nature that is so often missing in more developed work. And yet more developed work allows me or any artist to use the more formal aspects of art to create something expressive. I love that as well. 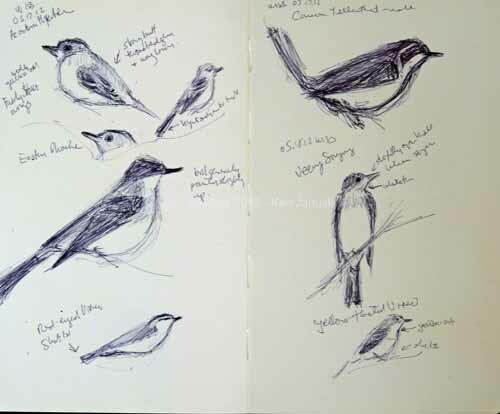 But when I first started using birds as subject I really didn't want to just use them as skeletons upon which to hang some abstract mark making and design. I think I've accomplished that. No matter how abstract or expressionistic I might be in my work it is always founded in field work. I'm not sure that there's much of a market for this type of work but at least I am doing exactly what I want to do. You can't ask for too much more than that. Well maybe winning a prize or two. 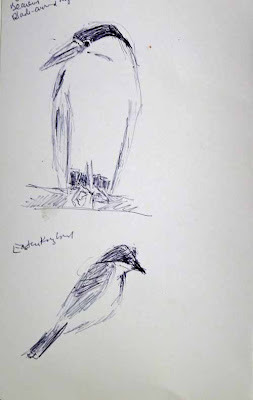 Speaking of which I just heard that I won't be garnering any honors as a BBC Wildlife Artist of the Year. I was a finalist but did not get further than that. This is disappointing and I'm sure when I see the results I'll question some of the winners. But I also know how high the quality has been for some of the former prize winners. It can be a stiff competition and I'm happy to have been a finalist again this year. I look forward to seeing the actual winners. And to see if any are online friends and acquaintances of mine. 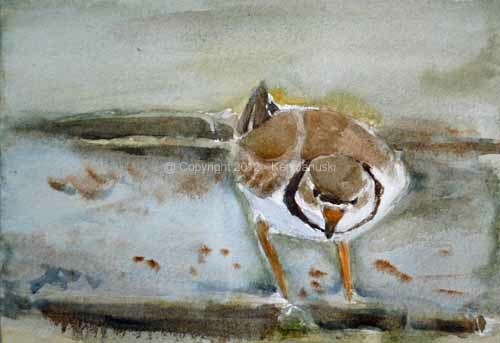 Last year in early May our exciting visit to 'The Biggest Week in American Birding' at and around Magee Marsh in Ohio was made even more exciting when I received an email saying that I was a finalist in the 'International Artists' category for BBC's Wildlife Magazine Wildlife Artist of the Year. There was a bounce in my step as I lugged all my birding and sketching gear around Magee Marsh! I had noticed that many people had announced their finalist status on their web sites. But I didn't want to jinx a good thing, nor come afoul of an etiquette I might not be familiar with, so I didn't announce my finalist status online until the final judging date was long passed and I hadn't heard from BBC. At that point I was happy to advertise that I'd been named a finalist. This morning I got another surprise email - I'm a finalist again in the International Artist category! If you do a quick web search you'll see that a number of others have been as well, somewhere over 100, and many have announced it. So I'm less hesitant this year to say that I'm again a finalist, this time for one of my favorite linocuts, 'Ten Terns', seen above. I think it represents me fairly well as an artist. Final judging will be this week. I'm hoping for the best. Here is a link to the 2011 winners, complete with their work. By the way this has been a good week for 'Ten Terns'. It's also featured in Wildlife Art Journal's Gallery of the Commons. At the moment this article is available to everyone but it may change back to being available only to subscribers at some time. When I was a young ARTIST I had no patience with rules, with constraint, with tradition. Real artists innovated. Since then I've come to realize that this romantic notion is probably one of the most harmful in the last 150 years of art. Art doesn't come out of nothing. The best art, and you can easily see it in people like Cezanne, Picasso, Matisse to name a few modern ones, struggles to both digest and improve the best art that comes before it. Sometimes these struggles can be painful to watch. I remember grimacing at some very early Cezannes. But he was just trying to come to terms with what went before to eventually portray the world as he saw it. So often I think constraints and tradition are good. Sometimes it's the challenge of fulfilling a specific commission that seems most likely to bring out the most invention and creativity in an artist. You need something to react against. On the other hand some artists including the long suffering Michelangelo might just as soon boil their patrons in oil. I've never studied Michelangelo's history closely. But it's the impression I've picked up. His patrons, particularly the papal ones, took a lot out of him. If you think that mentioning Cezanne, Picasso, Matisse, Michelangelo in terms of my own work is grandiose you're right. But I had to think about the idea of constraints in art when my local art center decided that the theme for the next show in June would be 'Bike Art'. I once spent a lot of time riding bikes, often in bad weather up steep hills. I live near the top of the famous 'Manayunk Wall' that is a big part of Philadelphia International Championship, and the reason that there's going to be such a theme for the show. So I definitely have some sympathy with bicycles, though more with riding than racing. Still I've been in no hurry at all to come up with an art work based on bicycles. I didn't want to work with the constraints of 'bike art.' 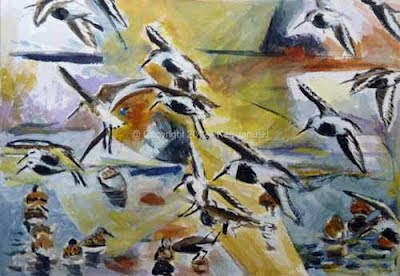 Eventually the theme was broadened to motion, activity, sport so I thought I might be able to do something based on birds in flight that would work. The results are at the top, a small watercolor and gouache of part of a Dunlin flock coming in to rest in shallow water. My photo that this is based on shows a remarkable orchestration of wings, legs and torsos. How in the world do they land together without horrendous crashes? There is also a tremendous sense of motion and activity. So that's what I've tried to show here. My brushwork and composition is deliberately rough and frenetic. I've never understood finely detailed renderings of frenetic activity. It has a frozen quality to it that I just can't enjoy. So that was the idea behind this. I've worked on it three or four times over the last five days. It may be done; it may require a lot more work; and it may end up in the trash bin. I need some time time to digest it and publishing it here always helps in that process. I really didn't want to do this painting. But now that I've spent some time on it I see that it's forcing me to try something different, to be more abstract than I normally am with birds. That's what got me to thinking about constraints in art. Sometimes they can be far more liberating than you ever would have guessed. As I was finishing the current state of the painting I was enjoying some background music on the radio. I had switched from my usual classical station to an independent rock station. The lyrics 'perpetual motion' were floating about. They seemed perfect for this scene. I had the vague feeling that the performing artists were Creedence Clearwater, a group I've always enjoyed passively, and that turned out to be the case. I've never bought their music and don't know much about them. But I do recall that I almost always notice their music when it's on, and always enjoy it. Thus the rest of the title. 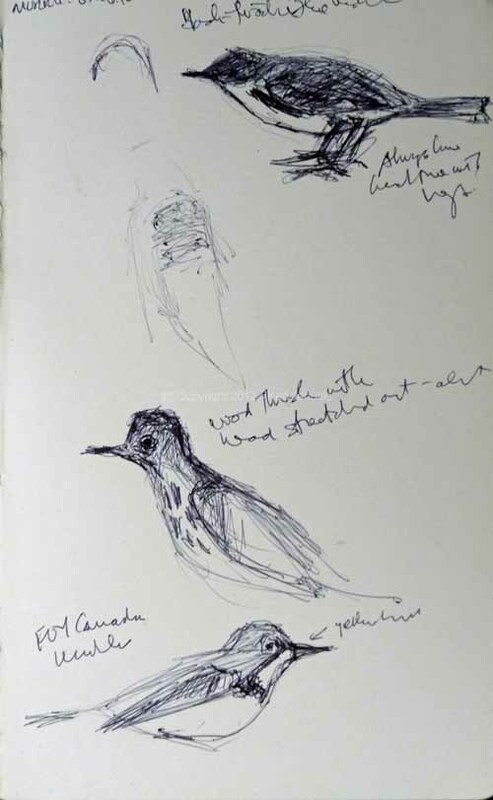 It's a bit difficult to explain the appeal of field sketching to someone who either doesn't sketch from life, doesn't know birds, or both. 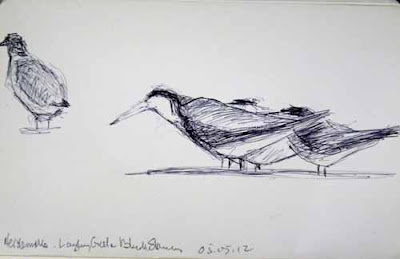 When I started seriously with field sketching birds about three years ago it was incredibly frustrating. Not only do most of them not sit still but often they're obscured by leaves, branches, etc. It's often easy to ID a bird with partial visual information. But it's much harder when you actually want to sketch it accurately. I've gone over this theme before so I won't pursue it more here. Suffice it to say that even with the mistakes you see here it's now gotten to the point where it is thrilling to be able fo sketch bird lives. The bird at bottom left of two pages of field sketches above is supposed to be a Red-eyed Vireo. In the top drawing I was disappointed as I almost always am with my Red-eyed Vireo sketches. I look at them as long as they're visible, try to remember everything I've seen and then put it down on paper. Splat! Another failure. Often I'll check guidebooks afterwards to see what I've gotten wrong. In this case I got a great but brief look at another Red-eyed a day or two later. One thing I noticed, particularly when seen from below, was how short the tail is. That is added information that is added to the second drawing. And I think it makes it seem a little more believable. I've been lucky enough to see Black-billed Cuckoos each of the last two springs in Philadelphia. But this years, which is shown at the top right of the top drawing is much more successful. After my disappointment with last year's sketch I paid more attention this time. The sketch above it by the way is a cuckoo in flight. I saw this before I actually saw the Black-billed Cuckoo. I had no idea what it was but couldn't ignore the extremely long pointed tail. When I actually found the cuckoo, perched horizontally on a branch as they often are, I knew what the long-tailed bird had been. All of these sketches are based on my visual memory a few seconds after staring at the bird. 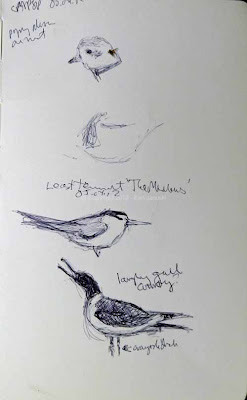 The one exception is the Yellow-throated Vireo at the bottom right of the bottom drawing. We saw him as we got into our car after birding at the Wissahickon this morning. In fact I'd already put away my binoculars and had to get them back out. Often these birds seem hidden high in the leaves, singing vigorously but completely invisible. But this one was at eye-level at one point. My sketchbook was also now in the back of the car. But about a half an hour when I got home I did the sketch, based on what I remembered. Other birds portrayed include numerous Acadian Flycatchers, and Eastern Phoebe, Common Yellowthroat and singing Veery all seen at the Wissahickon over the last two days. 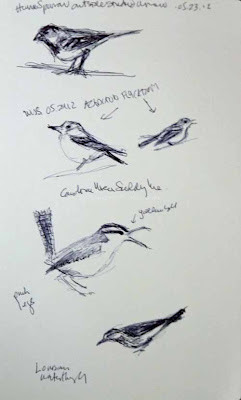 The top drawing includes a Black-throated Blue Warbler, Solitary Sandpiper, with badly drawn legs, and a Northern Rough-winged Swallow most seen last weekend as part of the Pennsylvania Migration Count. Though there can be a certain evocation of the actual even when looking at photos taken of birds seen I always find it very thin. I end up responding to the photo not to my memory of the experience. For evoking the experience itself there's nothing better than a field sketch. I think many artists who draw from life, regardless of subject, will understand this. As a long time abstract artist I always realized what I was missing by no longer working from life. I gained other things that made up for it, especially an almost total formal freedom. But I'm quite happy to be back drawing from life. There is still plenty of room for abstract freedom. The newest edition of 'Bird Conservation' from the American Bird Conservancy focused on the dangers to the shorebirds of the worlds. A number that jumped out at me was the total estimated world population of Piping Plovers, around 6500. If that number is correct the watercolor and gouache painting above represents about one tenth of one percent of the entire world population. 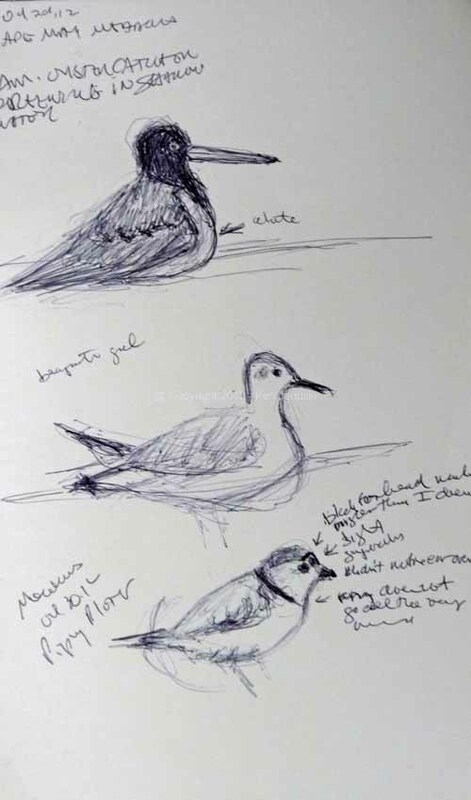 A little over three years ago I wrote a post on Piping Plovers. In it I covered the same theme. When you see a lone bird, or even more a couple as I showed in the previous post, they are the cutest birds in the world. The problem with this is that for all that it attracts some people to them it probably alienates others as sentimentality. Would people feel the same about them if they looked more like Turkey Vultures? But this isn't the birds fault. They just happen to have an appearance that most humans will I think translate as cute, loveable, harmless, something to be protected. The most brutal example of the other side of the coin is the bumper sticker I saw at least 10 years ago that said 'Piping Plover Taste Like Chicken.' The ignorance betrayed in this is hard to ignore. Obviously those who designed it and those who sport it on their vehicles think that they're really quite clever. Or course they're not; just ignorant. But behind it there is a sentiment that occurs in all environmental battles, the fact that much of the audience surrounding the environment or species to be saved considers it worthless or certainly down toward the bottom of things it personally values. I've never asked someone who sports such a bumper sticker what they think it means but my guess is that they think it is a funny joke on people who love cute things and a comment on what their own values are. I'd further guess that their values are pretty self-centered. I think that civilization, society, or whatever you want to call it, depends upon something broader than self-centeredness, or at least a self-centeredness that realizes that what is good for one's community is also good for oneself. The mighty, isolated island of a person, is a bit of a myth. Recent American politics seems to have completely forgotten this and all the politicians who realize that a concern for the common good, often involving a stomach-churning compromise with people or ideas you dislike, is necessary are either being driven out of office or resigning. Perhaps I'm misremembering but I recall reading in a new biography of William Buckley, of all things, that there was a time when true Republicans considered it almost a requirement to be concerned with society at large. That is now gone, and I'd say from both parties. Everything seems motivated by self-interest, which in turn seems fed by a voting electorate that also is primarily concerned with self-interest not a concern for their community or society at large. I hope I'm wrong about the voting public. But I don't think so. If I were the extreme fringe of both parties wouldn't get elected. Well this is a far tangent from where I began. My point though is that conservation really requires a concern for society at large and for society in the future as well as today. It's always seemed to me that the first lesson taught to real estate developers is 'Destroy First, Think About the Consequences Later.' I saw this in my own neighborhood over the last few years as a very old Dogwood and other trees were destroyed so that something else could be built. Of course if never was. Who knows why. But I do know that the dogwood is now gone. Something 100 years in the making most likely. Gone without a thought. And replaced by a small gravel parking lot that looks like an afterthought. Like what do we do now that there's not going to be anything built here and we've destroyed what was here. It is the idiocy almost criminality of such thinking that makes me always side with conserving the environment first, not chopping down trees first and then thinking about what to do next. What is good for society at large and in the future is sometimes hard to gauge. Maybe some compromises need to be made in order to keep jobs in the community. Maybe it is wrong to destroy the traditional livelihood of people in order to save a species that few of them know or appreciate. So thoughtful compromises probably need to be made. But until we have a society that has some interest in 'thoughtful compromise' I'll stand with enviormentalists and these 'cute' birds. Once they're gone, they're gone for good, with no one knowing the consequences. I still have more field sketches from our Cape May trip to post but given all I've seen at home since getting back I wanted to post some field sketches from here. The biggest surprise was a mature Red-headed Woodpecker seen today along the Wissahickon in Philadelphia. This is a bird that's not uncommon in Pennsylvania but is in Philadelphia. I was shocked to find an immature along the Wissahickon last fall and was even more shocked when he stayed until mid-March of 2012, maturing into his ruby red head and other striking black and white feathers. They did breed here in the 19th century, in fact right along the Wissahickon, but I doubt they've been seen more than once a year in Philadelphia over at least the last 25 years. At least that is the impression that I have after talking to a number of expert birders here. So wouldn't it be thrilling to learn that this one stayed and might even be breeding? Who knows. I haven't seen him in 2 months. Today I found him while chasing a warbler song about 200 yards from where he overwintered. That sure seems like strong evidence for it being the same bird even though he seem to have disappeared for two months. Obviously I'll be keeping a close lookout for him now. 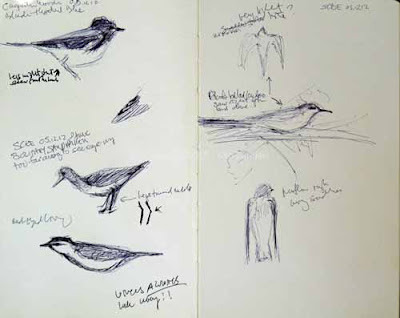 He is in bottom right of sketch above, picking insects off Sycamore leaves. Also above a male Baltimore Oriole, first of year female Rose-breasted Grosbeak and Red-eyed Vireo on left. On right a confusing waterthrush that seemed to be singing a Northern Waterthrush song but which I finally determined to be a Louisiana, an Eastern Phoebe and finally the feeding Red-headed Woodpecker. A couple of days ago we had a great look at a male Scarlet Tanager very close to us, not singing but calling his very loud chick-burr call. We also saw our first Acadian Flycatcher in Philadelphia for 2012. Those sketches are above. 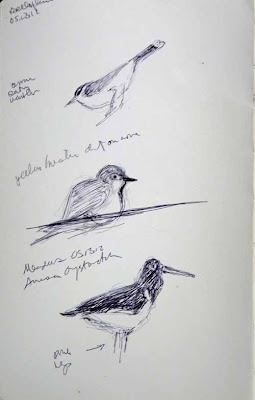 Finally some sketches from Carpenter's Woods. A Black-throated Blue Warbler at top, followed by a very alert Wood Thrush whose neck was quite stretched out, and finally a first of year Canada Warbler. Unlike the Cape May sketches none of these were done with the aid of a spotting scope. It is so much easier when you have both hands free to draw and go back to the scope to check details. 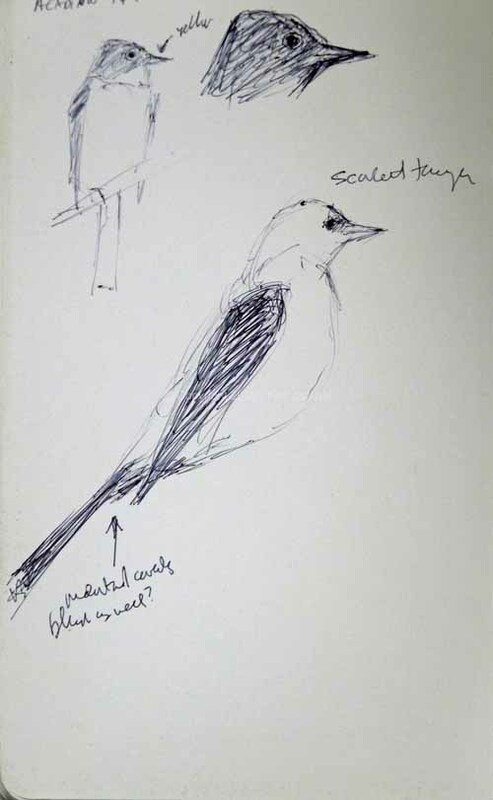 But most passerines don't sit still long enough for a scope to be of much use. This is particularly true of warblers. 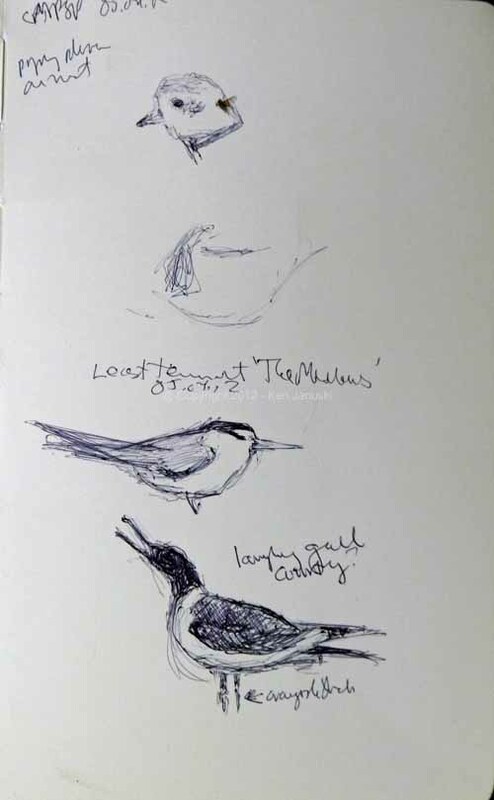 So all of these sketches were based on looking at birds in binoculars for a few seconds then trying to remember what I saw and put it down. By the way Blogger seems to have done something recently to eliminate paragraphs and/or line breaks. So text has become jumbled together and very hard to read. I can only hope they fix it soon. It's hard to imagine anything I enjoy more than seeing birds that I don't see that often and being able to sketch them. For seeing a lot of birds, both in numbers and variety, it's always hard to beat Cape May, NJ and the surrounding area. There are probably/possibly other places in the US that are just as good. It's hard to beat Magee Marsh in Ohio for warblers. But Cape May is very close to us and it's the area I know best. One problem with sketching at Cape May is that there is just too much to see. 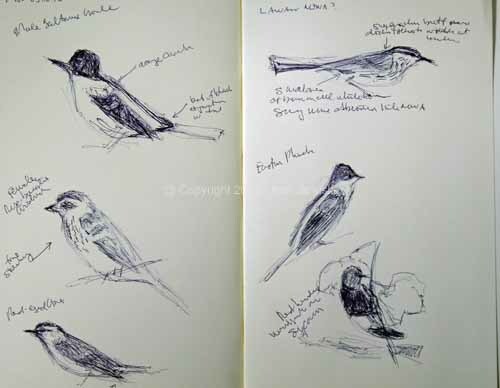 Should I sketch or try somewhere else to see more birds? Should I also take some reference photos for birds for which I have no good photos? There are always such decisions at hand. But I've gotten better at spending more time sketching. And my wife humors me and doesn't complain about needing to move on. That said above is one of my sketches from this trip. All are ballpoint pen in a Moleskine sketchbook. Above three Black Skimmers on a spit of land, with a Laughing Gull off to the left. Above is the first page of field sketches from the trip: an American Oystercatcher, in the water and preening. That's why you don't see the feet. Below a Bonaparte's Gull that started off in the water then moved to land. And finally a Piping Plover. 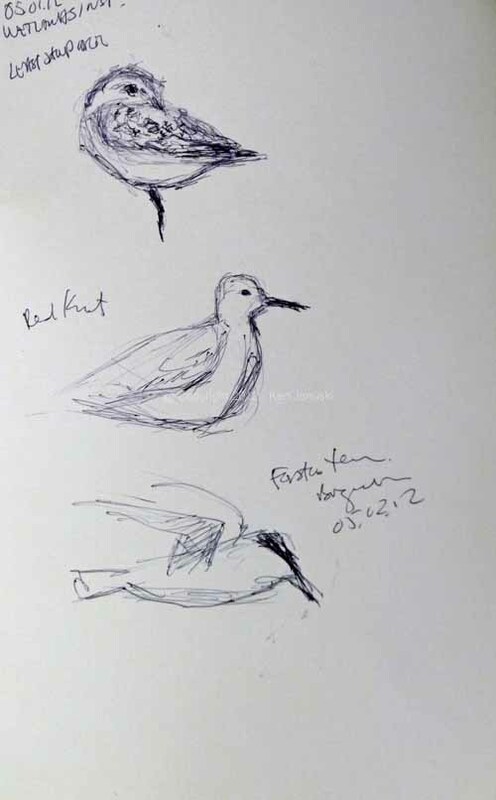 The Piping Plovers and American Oystercatchers were both nesting in same area so it was a great opportunity to sketch both. We ended most days with a quick trip, and sketch, through that area. One of the other endangered birds that are protected along Cape May beaches, along with the Black Skimmer and the Piping Plover, is the Least Tern. I was afraid that we were going to end the trip without seeing them. Then on our last night, on the far side of a pond at 'The Meadows' we saw one. That is him above, along with a Laughing Gull and the head of a Piping Plover. I don't know all that much about shorebirds. But I have the vague recollection that they feed in different areas of any 'shore.' As in many things the bullies crowd out the smaller birds. 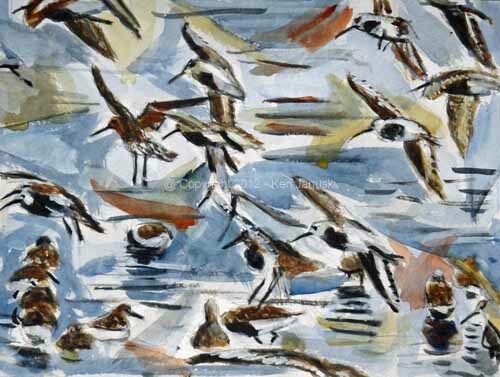 So it took us a while to find one of our favorite little shorebirds, the Least Sandpiper. He is at top above, along with a Red Knot and a hovering Forster's Tern, just waiting for the right moment to feed. 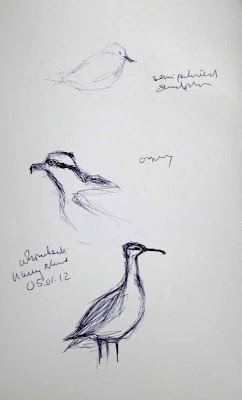 My last sketch was done this morning as we used our last few hours at Heislerville WMA. There were thousands of birds there, probably 90% being Dunlin. But Black-bellied Plovers, Short-billed Dowitchers, Least and Semi-palmated Sandpipers were scattered about, along with yellowlegs and skimmers. In this last sketch I tried to pick out Black-bellied Plovers, Short-billed Dowitchers and Dunlin to show their comparative size and shape. These are less than half of the sketches and I'll probably show more soon. When I got home the mail included 'Bird Conservation' magazine from American Bird Conservancy. I was just realizing how much I enjoy seeing shorebirds and this new issue summarizes many of the threats these fascinating and beautiful birds face. It is well worth reading, and well worth joining American Bird Conservancy.